For the last two years, Dutch politics have been in constant turmoil (see “Imperialist War Fuels Racist Backlash in the Netherlands,” The Internationalist No. 14, September-October 2002). The current coalition government of the Christian Democrats (CDA), Liberals (VVD) and Liberal Democrats headed by CDA leader Jan Peter Balkenende took office at the end of May 2003. In May 2002, the coalition of the social-democratic Labor Party (PvdA) and bourgeois parties (known as the “Purple” or “red-blue” coalition) was defeated in an election held days after the killing of notorious immigrant-basher Pim Fortuyn. This led to the formation of a right-wing cabinet (“Balkenende I”) which was soon mired in squabbling and fell apart last October with the departure of the remnants of the Lijst Pim Fortuyn (LPF). 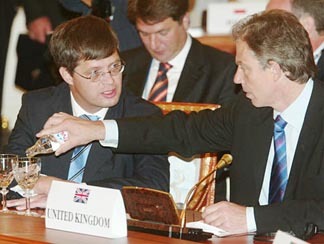 In the parliamentary elections in January 2003, the Labor Party made big gains at the polls but fell short of a majority, and after four months of negotiations the right-wing parties formed a reshuffled cabinet. On September 20, a popular-front protest against the “Balkenende II” government was held under the slogan “Turn the Tide,” with the support of the unions, the Labor and Green parties and various left parties. The following article is translated from De Internationalist No. 3 (September 2003), Dutch-language publication of the League for the Fourth International. SEPTEMBER 18 – The austerity program planned by the Balkenende II government represents a massive assault on the working class and oppressed. It is no accident that this-ruling class offensive runs parallel to the direct participation of Dutch Marines in the colonialist occupation of Iraq and to the continuing racist anti-immigrant campaign. It’s not just that we have experienced – up to now – a more or less one-sided class war with the result that tens of thousands of women and young people toil for less than the minimum wage (while sales of Bentley, Ferrari and Porsche luxury automobiles are booming). While Dutch supermarket operator Royal Ahold, the third-largest merchandising company in the world, piled up billions in fictitious profits, making it notorious as the “European Enron,” Dutch workers are seeing their social gains shredded. The battering ram for this ruling-class assault on the whole of the working class has been the stepped-up segregation and repression of immigrants, a campaign being waged in the name of a crusade against “terrorism”. This is the face of imperialist war “at home.” Thus working-class opposition to capitalist austerity must also mean opposition to both to imperialist war and anti-immigrant campaigns. The government’s motto could be summed up as “export or die.” The collapse of the Soviet Union (1989-92) opened up a new period of fierce inter-imperialist rivalry which exploded into plain view during Gulf War II. In this contest, military might remains the guarantor of imperialist investment and markets. So Dutch capital needs its weaponry (however modest compared to the “great powers”) in order to give a public relations boost to the U.S./British conquerors and gain a seat at the table in the imperialist plunder of Iraq. At the same time, it is ruthlessly reducing its “social overhead” costs, which the capitalists consider an impermissible “drain on profits” – even if some of its “citizens” are thrown on the scrap heap and obliged to eat dog food. Outrage against the government’s austerity package is widespread, as are calls for trade-union action, including strikes, perhaps even national strikes. But the response of the mutli-ethnic labor movement must not be limited to defending past social gains, modest as they were, which are now being ripped up. Instead, there must be a counteroffensive against capitalist austerity, in defense of fellow immigrant workers both legal and “illegal”– which must mean nothing less than full citizenship rights for all – and against the imperialist occupation of Iraq. This is not to be accomplished by tacking on the call “Troops out” to the laundry list of demands raised at this year’s “Keer het Tijd” [“Turn the Tide”] demonstration, as pseudo-revolutionaries like Offensief (affiliated with Peter Taaffe’s Committee for a Workers International) and the International Socialists do. The organizers of this protest have set themselves the ultimately trivial task of removing the present cabinet. This can only mean putting the social democrats of the PvdA back in the driver’s seat, perhaps together with various liberals, the openly pro-capitalist Green-Left party and the no less reformist and social-patriotic Socialistische Partij. And this only means more capitalist cutbacks under another color. The working class has the social power not only to stop this capitalist assault in its tracks, but ultimately to expropriate the bourgeoisie and put an end to its system of economic crisis and imperialist war. But this means hard class struggle rallying all the oppressed to the side of the working class, not begging or pressuring (even in the form of a token one-day national strike) this or that bourgeois government. 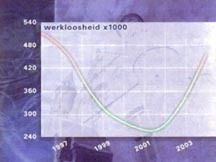 We should remember how the strikes and demonstrations against the earlier cutback plans of the social-democratic Kok regime were sold out by the FNV [social-democratic trade-union federation] tops in 1991. Only a revolutionary workers party armed with a Trotskyist program can lead a successful struggle against the bourgeoisie’s offensive. Defeat the Jackal Imperialists in Iraq! The bubble of U.S. imperialist triumphalism after its “blitzkrieg” against Iraq has already burst. As the Volkskrant (24 July) put it, the U.S. lacks “the manpower and the finances to build a viable society in Iraq.” The NRC Handelsblad opined wishfully, “Necessity is driving the Americans back to the path of multilateralism.” Of course, Washington never had any intention of building a “viable society” in Iraq, and its gestures in the direction of “multilateralism” can’t hide U.S. imperialism’s drive for world hegemony. But despite its military might, its own industrial infrastructure is rotting away, as most recently demonstrated by the [August 2003] East Coast power blackout. And it turns out that the looting in Iraq that the U.S. itself encouraged, not to mention acts of sabotage, compounded by deterioration due to a decade of imperialist blockade, are barriers to profitably exploiting the Iraqi oilfields. At the same time mounting opposition among the Iraqi masses to colonialist rule has meant mounting losses among the troops, pushing U.S. imperialism to “outsource” the tasks of occupation. Contingents from Central American client states or from Poland and other East European bourgeois regimes are hardly sufficient. So the stage was set for a new round of horse-trading under the fig leaf of the United Nations. The European rivals of U.S. imperialism, who were supposed to have been frozen out of Iraq, think they see their chance. “Peace-loving” Chirac and Schröder already voted to recognize the U.S. “occupation authority” in Iraq, and they long to send troops (and money) if and when German and French imperialism are assured of some spoils form the pillaging of Iraq. This only demonstrates once again that any class-collaborationist reliance on the European imperialists as a counterweight to the U.S. ends up meaning support to “multilateral” colonialist occupation. Dutch imperialism was quick to jump on the U.S. chariot. This is best captured by the appointment of Philip Carroll, former head of Royal Dutch Shell in the United States to “advise” (i.e., dictate to) the Iraqi Oil Ministry – the “special relationship” to the U.S. is still very much a connection via Britain. 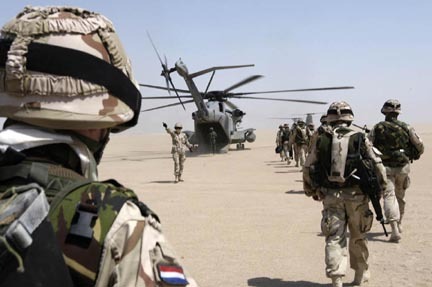 Meanwhile KLM is already selling round-trip tickets from Baghdad… Thus Dutch Marines were dispatched to the Al-Muthanna region ultimately in order to ensure profits for the Dutch trusts. 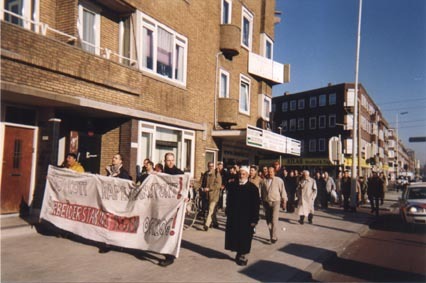 While this was going on, a picket against the sending of troops was organized by the Iraqi Platform in the Netherlands, accompanied by a few Dutch leftists. The police in the Dutch capital, The Hague, first stopped the protesters from handing out leaflets to members of parliament and then simply banned the demonstration altogether, which had to merge with another demonstration protesting the government’s housing policies. Even so, a member of Lawyers for Peace was arrested for the “crime” of leafleting. Such is “democracy” in the Netherlands today. Basically, Iraqi refugees, who have no rights and are mostly targeted for deportation already, were an easy target. But where was the Dutch left? Neither the parliamentary rubber-stamping of the colonial occupation nor the actual departure of the troops provoked any significant mobilization. Hundreds of thousands took to the streets to protest the “American war,” sowing illusions in the “pacifist” European imperialists, illusions reinforced by the fake left’s denunciations of Bush and Blair. When “their own” imperialist bourgeoisie joins the colonial occupation of Iraq, these “peaceniks” barely utter a peep of protest. 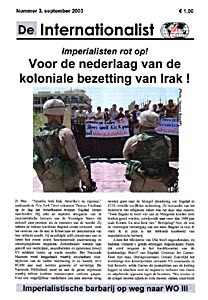 The Socialistische Partij (SP) is posturing as an opponent of Dutch participation in the colonialist occupation of Iraq. What is the reality? 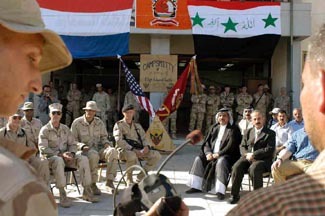 One of the principal themes of its parliamentary intervention was danger to the Dutch troops from the depleted uranium shells with which U.S. imperialism has irradiated Iraq. Would it be alright if the Dutch Marines (with their long history of colonial massacres in Indonesia and elsewhere) could terrorize the Iraqi population at no risk to themselves? It seems so, since SP foreign policy expert van Bommel is on record, in a text dated June 4, of favoring a Dutch “contribution to the pacification [our emphasis] and reconstruction” of Iraq. With U.N. blue helmets, of course, and as long as it is not under U.S. hegemony. This party, which has often enough demonstrated its support to “national defense” and even enthused over the presence of Dutch troops in Kosovo, is not any kind of anti-imperialists, but rather good Dutch patriots, of the anti-American variety. We Trotskyists, while politically combating Arab nationalism and all the Islamic currents, stand on the side of those in Iraq who seek to expel the imperialist occupiers from their land – by any means necessary. You can look everywhere in “revolutionary” newspapers like De Socialist or Offensief and you will find only the demand “Troops out.” Whose side are they on in this continuing war? These papier-mâché “revolutionaries” are unwilling and unable to call for the defeat of their “own” bourgeoisie. In fact, if the colonialist occupiers are driven out of Iraq it would be a victory for the workers and oppressed here. It is therefore necessary and urgent to mobilize here at home for this goal with the methods of the class struggle. Workers’ strikes and boycotts of shipments of war materiel to Iraq are more than ever on the order of the day! The pogrom atmosphere scapegoating immigrants that was whipped before and after the death of Fortuyn has served to guarantee popular consent to a barrage of police-state measures (while fascist elements are held in reserve). The arbitrary refusal of applications and deportation of refugees, raids against “illegal” immigrants, the legal/financial barriers put in the way of legal immigration have culminated in the first negative migration rate since 1984. A robbery and murder in Tilburg in July thus became the pretext for sweeping accusations against “criminal Antilleans” (from the Caribbean) and a crackdown in the city involving random searches, camera surveillance and more cops on the street. Then, on September 8 the mayors of six different cities jointly called for banning young Antilleans with an arrest record from moving to their towns. This is only one of several proposals aimed at legal segregation. When a study revealed the extent of segregation in Amsterdam’s schools (54 of 201 primary schools have only immigrant pupils and 30 are completely “white”) officials shrugged their shoulders and said it could not be reversed. In fact, the LPF in Rotterdam has proposed to dictate to immigrants where they can and cannot live, banning them from moving them to the city (and hinting that they should be deported to the countryside). This in turn was supported by a PvdA councillor, and another Labor member of parliament proposed confining poor youth from the Antilles who want to migrate to the Netherlands in “boarding schools” for “social education.” The suggestion this June by the police chief of the Hague, Wiarda (now in charge of the European taskforce of police chiefs! ), that immigrants should receive harsher penalties for the same crimes than “natives,” since after all they have different “morals,” was perhaps premature for the bourgeoisie. But when you add it all up these are moves in the direction of open legal discrimination, ultimately, a Dutch version of apartheid. On August 6 Amsterdam cops gunned down a Moroccan man, Driss Arbib, leading to community protests calling for “an independent commission of inquiry”. But such an organism would do nothing to stop the wave of state repression against immigrants. As a spokesperson for the committee which organized an August 16 demonstration remarked: “Only a day after the committee was set up, we were told by the media and by politicians that we were exploiting the death of Driss and polarizing the situation. But the situation is already polarized: hatred, racism, Islamophobia, September 11” (De Socialist, September 2003). The demand for an independant committee is backed by the reformist Internationale Socialisten, whose article speaks of “senseless police violence.” Not “senseless” from the standpoint of the class interests of the bourgeoisie! De Socialist’s exposé of “racism in the [police] corps” actually means placing the blame on the behavior of individual racist cops. Like their political partners of the Arab nationalist (and socially reactionary) Arabisch-Europese Liga (Arab-European League), the IS spreads the illusion that police can be something other than a tool of the capitalist class. The power of the working class must be mobilized against such police atrocities, through demonstrations and strikes. This ultimately means the organization of worker/immigrant self-defense groups against racist terror. The capitalist offensive can never be successfully combated if the working class is hobbled by racial and ethnic divisions. Full citizenship rights for immigrant workers and their families! After the Moroccans, comes the turn of the Antilleans, who are scurrilously portrayed as parasites on the Dutch nation. For decades bourgeois propaganda has played on the theme that “illegal” immigrants were welfare cheats. Then it was the people on disability pay (WAO), the unemployed – who’s next? Now we know – the sick, the elderly, women who want birth control. The bourgeoisie’s austerity program lays bare the suffocating oppression that women face in the Netherlands. Almost three quarters of Dutch women work part-time (although women are now the majority of university graduates, this figure has remained the same for 30 years). Furthermore, women are paid a quarter less than men. Yet despite these barriers, the government intends to cancel government assistance to single mothers and force them to work, even as firms are cutting back on child care. An alibi was provided by a vicious article in the popular business journal Elsevier in mid-May claiming that women “don’t like to work,” are only interested in child-rearing and have to learn “responsibility” through “sacrifice.” Since the capitalist system fundamentally abdicates social responsibility for child care, blame the victim! This is an ideology dating back to the spinning wheel, and will be swept into the trash bin of history where it belongs by a workers republic which provides free 24-hour child care. As we wrote a year ago: “Within this racist consensus, Fortuyn simply expresses openly, brutally and consistently the political and economic interests of the ruling class – dismantling the welfare state, depressing wages and creating a reserve army of labor from those presently on disability. […]” (De Internationalist No. 1). This means reaction all down the line, and that is what is happening now, although Fortuyn is no longer on the scene. Unemployment rate in the Netherlands has almost doubled in one year. And the racist hysteria is driven by the economic crisis. Between spring 2002 and 2003, the official unemployment rate almost doubled, reaching 400,000. Layoffs and plant closures by well-known firms are almost a daily occurrence. In August, Philips announced that it would sell off or close one-third of its factories in the next few years. At the same time, a major shipyard in Holland, the Van der Giessen de Noord, announced it was closing. And now comes the news that the department store Vroom and Dressman is to slash as much as a quarter of its workforce. Economic Affairs Minister Brinkhorst nonetheless cynically preaches that everyone should work harder. Actually, this has already been imposed. The workweek has increased by three hours over the last two years. Average overtime doubled during the same period. And of course, overtime for one means unemployment for the other. Karl Marx had already explained this aspect of capitalist crisis in Capital: the unemployed (the “reserve army of labor”) are used as a club to increase the rate of exploitation of the employed. The situation cries out for a sliding scale of wages and hours, to divide up the available work among all the workers, without a cut in pay. But this demand cannot be satisfied by any capitalist government. As Leon Trotsky noted, the sliding scale of wages and hours is the first step to a socialist planned economy which can only be carried out by the workers and their allies themselves. Capitalist War on the Workers with All-Out Class Struggle! The whole “left” devotes itself to denouncing Balkenende and his “hard right” government. The goal is to bring out the masses for an event in which they will addressed by a speaker… from the PvdA, the previous manager of capitalist austerity. To be sure, the Socialistische Partij (social democrats of the second mobilization) will also be there, but SP chairman Jan Marijnissen’s chauvinist social-pacifism will keep protest safely within the bounds of social democracy, and his flirt with the traditional reformists of the PdvA is so deep-going, and so embarrassing, that it has even evoked faint moans of protest from the SP’s house opposition, the Offensief group. Marijnissen’s real strategy is to put pressure on Balkenende from “within” (the government) and “without,” making an open appeal to sections of the Christian Democrats: “Naturally, the cabinet has a majority in parliament. But some CDA deputies must be aware that there is great discontent in their own ranks about the course taken by the cabinet. The ice-cold austerity measures, the further auctioning off of the public sector and the deepening polarization of society: this is in the spirit of Reagan and Thatcher, not the good Samaritan Marga Klompé, the Christian Democrat who combated the reality of poverty by setting up the welfare system” (Volkskrant, 18 July). There you have it: while the capitalist class is ripping up democratic rights, the parliamentary majority is sacred. But fortunately all is not lost, hopefully some “good Samaritans” will reject “foreign” ideas. Quite at home in the chauvinist SP, Offensief has now produced a major statement (“All-Out to Resist the Anti-Social Cabinet”) against Balkenende and calling for a 24-hour general strike against the government’s austerity plans. This is a chemically pure example of the “economism” that Lenin so vehemently denounced – that is, the concentration on purely economic questions since the working class is allegedly too backward to understand the political issues. Economism in reality smuggles in reformist, i.e., bourgeois politics through the back door. In Offensief’s statement, we find a long denunciation of cutback proposals, which does not mention either the colonial occupation of Iraq or the racist anti-immigrant campaign! But Offensief does have a political line on these questions. A great part of the front page article in issue No. 163 of its paper entitled “Massive Cutbacks” is devoted to denouncing… the cutbacks in the justice administration and the police. The worst thing about the government’s attacks, it seems, is that it leaves the average citizen at the mercy of “robbers, rapists and other thugs.” In other words Offensief is calling for a general strike to demand… more police to break strikes and drag off dark-skinned co-workers. The bosses’ anti-worker, anti-immigrant offensive “at home” and Dutch participation in imperialist war abroad should be defeated by powerful working-class action. But the reformist and centrist pseudo-socialists’ calls for a “general strike” are at best an attempt to pressure the bureaucrats into simulating class struggle, in order to bring into being a new class-collaborationist “popular-front” to “turn the tide.” Last spring there was a series of large workers demonstrations last spring in France and a “general strike” in Austria, the first in half a century. But these never went beyond ritual parades. In the Netherlands, where things have been relatively quiet on the social front, the Abvakabo (public sector) federation as well as FNV Bondgenoten (amalgamated trades) and FNV Bouw (construction) have voted in favor of national strike action. But the top bureaucrats in the Federation Council (the presidents of the 14 FNV unions) say it is “too early” for such action (declaration of August 27). Their argument that the membership has to be “informed” is just a flimsy excuse. In reality they are wedded to further talks with the government. What’s to discuss? The government’s plans should be ripped up and thrown in their face. But the union membership does have to be prepared for a major class battle. A real general strike which paralyzes the country, whatever its motives and demands, inevitably challenges the authority of the state, posing the question of which class will rule. This means not only effective mass picket lines that nobody crosses and their defense against police and fascist attacks, as well as the need for elected strike committees counterposed to the treacherous pro-capitalist trade union bureaucrats. It requires a political program to unite the working class, championing the democratic rights of immigrants, and a series of transitional demands, such as the sliding scale of wages and hours which point the way to the expropriation of the capitalist class and the installation of a workers republic. And above all it requires a new, revolutionary leadership in opposition to the social democracy. Offensief’s call for a one-day general strike is precisely designed to avoid such a struggle. The principal spokesman for its international organization, the Committee for a Workers International, Peter Taafe, has provided a theoretical “justification” for a stageist conception in which not only socialist revolution, but also a real general strike, are postponed to never-never land: “Because of the lack of an alternative, the absence of a broad elemental socialist consciousness, the question of an all-out general strike linked to the working class coming to power would not be clearly posed even amongst the French workers, or elsewhere at this state. The mood is one of using their power, in effect flexing their muscles, to extract concessions from the government, to force it back, to stop its offensive. Therefore what is raised are slogans of a determined character but which at this stage stop short of an all-out general strike for power” (“The General Strike Today,” 26 June 2003). This defeatist “perspective” was penned as the recent strike wave in France was ebbing. These strikes, which produced both elected strike committees and militant strike pickets, were led into a dead-end both by the trade union bureaucrats who (rightly fearing a social explosion) channeled the workers into a seemingly endless series of national demonstrations, and by the “far left” which called not for revolutionary class struggle, but for a “general strike” as a means of pressure on the Chirac government (which they had supported in last year’s elections). Here too, the question of combating racist terror against immigrants (a key component of the workforce in private industry) was posed (as it was in 1995), in order to extend the strikes from the public sector. Peter Taaffe and his Dutch disciples have in mind just such a nice little token “general strike.” Referring to Engels’ observations on the 1893 Belgian general strike in which the government “took fright” and granted concessions, Taafe speculates that the imperialists might simply capitulate this time around as well. This is just not going to happen. And history records more than one example of half-hearted general strikes ordered by the trade-union bureaucrats faced with capitalist intransigence which went down to bitter defeat. The Belgian general strike of 1961, in which the pseudo-Trotskyist Ernest Mandel acted as a lawyer for the left-talking union bureaucrats who sold out the struggle, was a classic example. Today, the pseudo-Trotskyist Taaffe offers to play the same role. Since Offensief despairs of the possibility of forging a Trotskyist vanguard, and since it knows that a general strike poses the question of power, it is on the look-out for some social-democratic substitute to use as a governmental “alternative.” It pretends to have found it in the SP, which it claims could be the nucleus of a new workers party. But not a revolutionary one, mind you! In fact, on issues of crime and immigration, the SP’s reformism leads it to adopt openly reactionary, social-chauvinist positions. And this electoralist machine is not going to lead or mobilize any workers struggles. It is barely capable of subsidizing pie-throwing at bourgeois politicians. * In the late 16th century, the Dutch bourgeoisie sent the unemployed to a workhouse or debtor’s prison called the Rasphuis, which included a “drowning cell” where those deemed incapable of working were reputedly drowned by opening a sluice gate.